By meditation I mean prolonged reasoning with the understanding, in this way. We begin by thinking of the favor which God bestowed upon us by giving us His only Son; and we do not stop there but proceed to consider the mysteries of His whole glorious life. The dimensions of Christian meditation develop from God's having completed his self-revelation in two directions: Speaking out of his own, and speaking as a man, through his Son, disclosing the depths of man.... And this meditation can take place only where the revealing man, God's Son, Jesus Christ, reveals God as his Father: in the Holy Spirit of God, so we may join in probing God's depths, which only God's Spirit probes. Building on that theme, E. P. Clowney explained that three dimensions of Christian meditation are crucial, not merely for showing its distinctiveness, but for guiding its practice. The first is that Christian meditation is grounded in the Bible. Because the God of the Bible is a personal God who speaks in words of revelation, Christian meditation responds to this revelation and focuses on that aspect, in contrast to mystic meditations which use mantras. The second distinctive mark of Christian meditation is that it responds to the love of God, as in I John [4:19]: "We love, for he first loved us". The personal relationship based on the love of God that marks Christian communion is thus heightened in Christian meditation. The third dimension is that the revelations of the Bible and the love of God lead to the worship of God: making Christian meditation an exercise in praise. Thomas Merton characterized the goal of Christian meditation as follows: "The true end of Christian meditation is practically the same as the end of liturgical prayer and the reception of the sacraments: a deeper union by grace and charity with the Incarnate Word, who is the only Mediator between God and man, Jesus Christ." While Protestants view salvation in terms of faith and grace alone (i.e. sola fide and sola gratia) both Western and Eastern Christians see a role for meditation on the path to salvation and redemption. Apostle Paul stated in Epistle to the Romans 9:16 that salvation only comes from "God that hath mercy". The path to salvation in Christian meditation is not one of give and take, and the aim of meditation is to bring joy to the heart of God. The Word of God directs meditations to show the two aspects of love that please God: obedience and adoration. The initiative in Christian salvation is with God, and one does not meditate or love God to gain his favor. In Western Christian teachings, meditation is usually believed to involve the inherent action of the Holy Spirit to help the meditating Christian understand the deeper meanings of the Word of God. In the 12th century, decades before Guigo II's the Ladder of the Monk, one of his predecessors, Guigo I, emphasized this belief by stating that when earnest meditation begins, the Holy Spirit enters the soul of the meditator, "turns water into wine" and shows the path towards contemplation and a better understanding of God. The vistas of God's Word unfold to the meditating Christian solely through the gift of the Divine Spirit. How could we understand what is within God and is disclosed to us except through the Spirit of God who is communicated to us? Christian meditation is different from the style of meditations performed in Eastern religions (such as Buddhism) or in the context of the New Age. While other types of meditation may suggest approaches to disengage the mind, Christian meditation aims to fill the mind with thoughts related to Biblical passages or Christian devotions. Although some mystics in both the Western and Eastern churches have associated feelings of ecstasy with meditation, (e.g. St. Teresa of Avila's legendary meditative ecstasy), St. Gregory of Sinai, one of the originators of Hesychasm, stated that the goal of Christian meditation is "seeking guidance from the Holy Spirit, beyond the minor phenomenon of ecstasy". Modern Christian teachings on meditation at times include specific criticism of the transcendental styles of meditation, e.g. John Bertram Phillips stated that Christian meditation involves the action of the Holy Spirit on Biblical passages and warned of approaches that "disengage the mind" from scripture. According to Edmund P. Clowney, Christian meditation contrasts with cosmic styles of oriental meditation as radically as the portrayal of God the Father in the Bible contrasts with discussions of Krishna or Brahman in Indian teachings. Unlike eastern meditations, most styles of Christian meditations are intended to stimulate thought and deepen meaning. Christian meditation aims to heighten the personal relationship based on the love of God that marks Christian communion. According to Clowney it is the search for wisdom, not ecstasy, that marks the path of Christian meditation, a wisdom sought in the "Christ of Scripture and the Scripture of Christ". A 1989 document generally known as Aspects of Christian meditation set forth the position of the Holy See with respect to the differences between Christian and eastern styles of meditation. The document, issued as a letter to all Catholic bishops, stresses the differences between Christian and eastern meditative approaches. It warns of the dangers of attempting to mix Christian meditation with eastern approaches since that could be both confusing and misleading, and may result in the loss of the essential Christocentric nature of Christian meditation. The letter warned that euphoric states obtained through Eastern meditation should not be confused with prayer or assumed to be signs of the presence of God, a state that should always result in loving service to others. Without these truths, the letter said, meditation, which should be a flight from the self, can degenerate into a form of self-absorption. In the Old Testament, there are two Hebrew words for meditation: hāgâ (Hebrew: הגה‎), which means to sigh or murmur, but also to meditate, and sîḥâ (Hebrew: שיחה‎), which means to muse, or rehearse in one's mind. When the Hebrew Bible was translated into Greek, hāgâ became the Greek melete which emphasized meditation's movement in the depth of the human heart. Melete was a reminder that one should never let meditation be a formality. The Latin Bible then translated hāgâ/melete into meditatio. The Bible mentions meditate or meditation 23 times, 19 times in the Book of Psalms alone . When the Bible mentions meditation, it often mentions obedience in the next breath. An example is the Book of Joshua[Joshua 1:8]: "This Book of the Law shall not depart from your mouth, but you shall meditate on it day and night, so that you may be careful to do according to all that is written in it. For then you will make your way prosperous, and then you will have good success.."
During the Middle Ages, the monastic traditions of both Western and Eastern Christianity moved beyond vocal prayer to Christian meditation. These progressions resulted in two distinct and different meditative practices: Lectio Divina in the West and hesychasm in the East. Hesychasm involves the repetition of the Jesus Prayer, but Lectio Divina uses different Scripture passages at different times and although a passage may be repeated a few times, Lectio Divina is not repetitive in nature. The progression from Bible reading, to meditation, to loving regard for God, was first formally described by Guigo II, a Carthusian monk who died late in the 12th century. Guigo II's book The Ladder of Monks is considered the first description of methodical prayer in the western mystical tradition. In Eastern Christianity, the monastic traditions of "constant prayer" that traced back to the Desert Fathers and Evagrius Pontikos established the practice of hesychasm and influenced John Climacus' book The Ladder of Divine Ascent by the 7th century. These meditative prayers were promoted and supported by Saint Gregory Palamas in the 14th century. The methods of "methodical prayer" as taught by the Devotio Moderna group in northern Europe had entered Spain and were known in the early 16th century. The book The Imitation of Christ which was known in Spain as Contemptus mundi became known in Spain, and while Teresa probably did not initially know of Guigo II's methods she was likely influenced by its teachings via the works of Francisco de Osuna which she studied. Teresa's contemporary and collaborator, John of the Cross continued the tradition of Guigo II and taught the 4 stages of Lectio Divina. By the 19th century the importance of Biblical meditation had also been firmly established in the Protestant spiritual tradition. During the 18th and early 19th centuries, some components of meditation had started to be de-emphasized in some branches of Western Christianity. However, the early part of the 20th century witnessed a revival and books and articles on approaches such as Lectio divina aimed at the general public began to appear by the middle of the century. In 1965, one of the principal documents of the Second Vatican Council, the dogmatic constitution Dei verbum (Latin for Word of God), emphasized the use of Lectio divina and on the 40th anniversary of Dei verbum in 2005 Pope Benedict XVI reaffirmed its importance. A number of saints and historical figures have followed and presented specific approaches to Christian meditation. Both Eastern and Western Christian teachings have emphasized the use of meditation as an element in increasing one's knowledge of Christ. The Spiritual Exercises of Ignatius of Loyola use meditative mental imagery, with the goal of knowing Christ more intimately and loving him more ardently. In The Way of Perfection, St. Theresa of Avila taught her nuns how to try to get to know Christ by using meditation and mental prayer. 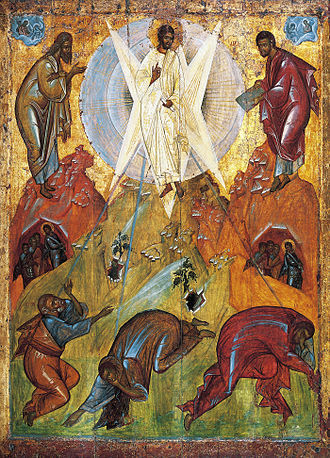 Hesychastic prayer and meditation continues to be used in the Eastern Orthodox tradition as a spiritual practice that facilitates the knowing of Christ. The Spiritual Exercises of St. Ignatius of Loyola (1491–1556), the founder of the Jesuits, contain numerous meditative exercises. To this day, the Spiritual Exercises remain an integral part of the Novitiate training period of the Roman Catholic religious order of Jesuits. The exercises are intended as notes to guide a spiritual director who is leading someone else through an experience of Christian meditation. The entire experience takes about 30 days and often involves a daily interview with the director. The process begins with a consideration of the purpose of one's life and the relationship with the rest of creation. It is followed by a week of meditation about sin and its consequences. Next comes a period of meditating on the events of the life of Jesus, and another for thinking about his suffering and death. The final week is to experience the joy of the resurrection, and in conclusion to reflect on God's love and the response of love for God. The exercises often involve imagery in which one enters a biblical scene. For example, the practitioner is encouraged to visualize and meditate upon scenes from the life of Christ, at times asking questions from Christ on the cross, during crucifixion. Saint Teresa of Avila depicted by Rubens, 1615. She is often considered one of the most important Christian mystics. 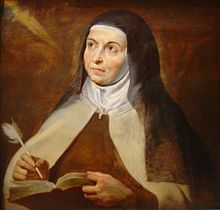 St. Teresa of Ávila (1515–1582) a Doctor of the Church, practiced contemplative prayer for periods of one hour at a time, twice a day. St. Teresa believed that no one who was faithful to the practice of meditation could possibly lose his soul. Her writings are viewed as fundamental teachings in Christian spirituality. St. Teresa taught her nuns to meditate on specific prayers. Her prayers described in The Way of Perfection involve meditation on a mystery in the life of Jesus and are based on the faith that "God is within", a truth that Teresa said she learned from St. Augustine. In her Life, she wrote that she taught herself from the instructions given in the book, The Third Spiritual Alphabet - by Francisco de Osuna - which relates to Franciscan mysticism. Her starting point was the practice of "recollection", i.e. keeping the senses and the intellect in check and not allowing them to stray. In her meditations, one generally restricts attention to a single subject, principally the love of God. In The Way of Perfection she wrote: "It is called recollection because the soul collects together all the faculties and enters within itself to be with God". She would use devices such as short readings, a scene of natural beauty or a religious statue or picture to remind her to keep her focus. She wrote that in due course, the mind naturally learns to maintain focus on God almost effortlessly. St. Theresa viewed Christian meditation as the first of four steps in achieving "union with God", and used the analogy of watering the garden. She compared basic meditation to watering a garden with a bucket, Recollection to the water wheel, Quiet (contemplation) to a spring of water and Union to drenching rain. In the preparation part, one places oneself in the presence of God and asks the Holy Spirit to direct the prayer, as in the Epistle to the Romans[8:26]: "The Spirit helps us in our weakness, for we do not know what to pray for, but the Spirit himself intercedes for us with sighs too deep for words." In the consideration part, one focuses on a specific topic, e.g. a passage from the Bible. In the affections and resolutions part, one focuses on feelings and makes a resolution or decision. For instance, when meditating on the Parable of the Good Samaritan one may decide to visit someone sick and be kind to them. In the conclusion part, one gives thanks and praise to God for the considerations and asks for the grace to stand by the resolution. Saint Padre Pio stated: "Through the study of books one seeks God; by meditation one finds him". Saint Thomas Aquinas (1225–1274) said that meditation is necessary for devotion, and the Second Vatican Council called for "faithful meditation on God's word" as part of the spiritual formation of seminarians. Saint John of the Cross (1542–1591), a close friend of St. Teresa of Avila, viewed Christian meditation as a necessary step toward union with God, and wrote that even the most spiritually advanced persons always needed to regularly return to meditation. "The person who meditates and turns his mind to God, who is the mirror of his soul, seeks to know his faults, tries to correct them, moderates his impulses, and puts his conscience in order." The Catechism of the Catholic Church encourages meditation as a form of prayer: "Meditation is above all a quest. The mind seeks to understand the why and how of the Christian life, in order to adhere and respond to what the Lord is asking" (Catechism section # 2705) and that Christians owe it to themselves to develop the desire to meditate regularly (# 2707). Emphasizing union with God, it states: "Meditation engages thought, imagination, emotion, and desire. This mobilization of faculties is necessary in order to deepen our convictions of faith, prompt the conversion of our heart, and strengthen our will to follow Christ. Christian prayer tries above all to meditate on the mysteries of Christ, as in lectio divina or the rosary. This form of prayerful reflection is of great value, but Christian prayer should go further: to the knowledge of the love of the Lord Jesus, to union with him" (#2708). Meditative prayer is different from contemplative prayer (See CCC 2709-2724). Christian meditation performed along with Eucharistic adoration outside of Mass has been associated with a large amount of Catholic writings and inspirations specially since the 18th century. The Eucharistic meditations of the two Saints Pierre Julien Eymard and Jean Vianney (both promoters of the Eucharist) were published as books. Saint Thérèse of Lisieux was devoted to Eucharistic meditation and on February 26, 1895 shortly before she died wrote from memory and without a rough draft her poetic masterpiece "To Live by Love" which had composed during Eucharistic meditation. Significant portions of the writings of the Venerable Concepcion Cabrera de Armida were reported as having been based on her adorations of the Blessed Sacrament. Similarly, in her book Eucharist: true jewel of eucharistic spirituality Maria Candida of the Eucharist (who was beatified by Pope John Paul II) wrote about her own personal experiences and reflections on eucharistic meditation. Meditation is an integral part of the rosary. This mode of meditation is the process of reflecting on the mysteries of the rosary. With practice, this may in time turn into contemplation on the mysteries. The practice of meditation during the praying of repeated Hail Marys dates back to 15th century Carthusian monks, and was soon adopted by the Dominicans at large. By the 16th century the practice of meditation during the rosary had spread across Europe, and the book Meditationi del Rosario della Gloriosa Maria Virgine (i.e. Meditations on the Rosary of the Glorious Virgin Mary) printed in 1569 for the rosary confraternity of Milan provided an individual meditation to accompany each bead or prayer. Saint Teresa of Avila's meditative approach of focusing on "the favor which God bestowed upon us by giving us His only Son" can be viewed as the basis of most scriptural rosary meditations. In his 2002 encyclical Rosarium Virginis Mariae, Pope John Paul II placed the rosary at the very center of Christian spirituality. Emphasizing that the final goal of Christian life is to be transformed, or "transfigured", into Christ he stated that the rosary helps believers come closer to Christ by contemplating Christ. He stated that the rosary unites us with Mary's own prayer, who, in the presence of God, prays with us and for us. and stated that: "To recite the rosary is nothing other than to contemplate with Mary the face of Christ." During the Byzantine Empire, between the 10th and 14th centuries, a tradition of prayer called hesychasm developed, particularly on Mount Athos in Greece, and continues to the present. St. Gregory of Sinai is considered by most to be the founder of the hesychastic approach to prayer. This tradition uses a special posture and breathing rituals, accompanied by the repetition of a short prayer (traditionally the 'Jesus Prayer') giving rise to suggestions that it may have been influenced by Indian approaches. "While some might compare it [hesychastic prayer] with a mantra, to use the Jesus Prayer in such a fashion is to violate its purpose. One is never to treat it as a string of syllables for which the 'surface' meaning is secondary. Likewise, hollow repetition is considered to be worthless (or even spiritually damaging) in the hesychast tradition." Rather, it is to be in the spirit of a true mantra. This style of prayer was at first opposed as heretical by Barlam in Calabria, but was defended by Saint Gregory Palamas. Coming from hesychia ("stillness, rest, quiet, silence"), hesychasm continues to be practiced in the Eastern Orthodox Church and some other Eastern Churches of the Byzantine Rite. Hesychasm has not gained significance in the Western churches. In hesychasm, the Jesus prayer, consisting of the phrase: "Lord Jesus Christ, Son of God, have mercy on me" is repeated either for a set period of time or a set number of times. Hesychasm is contrasted with the more mental or imaginative forms of Christian meditation in which a person is encouraged to imagine or think of events from the life of Jesus or sayings from the Gospel. 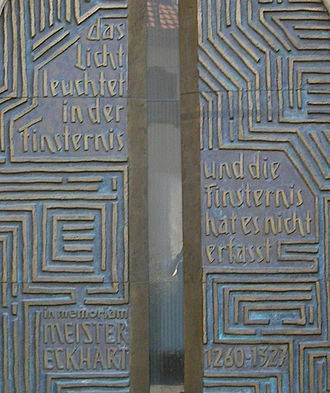 Sometimes hesychasm has been compared to the meditative techniques of oriental religions and it is possible that there were interactions between Hesychasts and Sufis, but this has not been proven. John Main OSB (1926–1982) was a Benedictine monk and priest who presented a way of Christian meditation which used a prayer-phrase or mantra. This approach was then used by groups which then become the World Community for Christian Meditation. ^ Steinfels, Peter (1990-01-07). "Trying to Reconcile the Ways of the Vatican and the East". New York Times. Retrieved 2008-12-05. ^ "Search | ESV.org". ESV Bible. Retrieved 2018-03-11. ^ "Bible Gateway passage: Joshua 1:8 - English Standard Version". Bible Gateway. Retrieved 2018-03-11. ^ "St. Teresa of Avila". Catholic encyclopedia. Retrieved 14 April 2010. ^ "Mount Athos: History". Macedonian Heritage. Archived from the original on December 7, 2009. Retrieved 12 May 2010. ^ "Hesychasm". OrthodoxWiki. Retrieved 12 May 2010. ^ "Hesychasm". Catholic encyclopedia. Retrieved 14 April 2010. In Christianity, Lectio Divina is a traditional Benedictine practice of scriptural reading and prayer intended to promote communion with God and to increase the knowledge of Gods Word. It does not treat Scripture as texts to be studied, Lectio Divina has four separate steps, meditate, contemplate. First a passage of Scripture is read, its meaning is reflected upon and this is followed by prayer and contemplation on the Word of God. The focus of Lectio Divina is not an analysis of biblical passages. In Lectio Divina, the practitioner enters and shares the peace of Christ rather than dissecting it, in some Christian teachings, this form of meditative prayer leads to an increased knowledge of Christ. The roots of Scriptural reflection and interpretation go back to Origen in the 3rd century, before the emergence of the Western monastic communities, a key contribution to the foundation of Lectio Divina came from Origen in the 3rd century, with his view of Scripture as a sacrament. In a letter to Gregory of Neocaesarea Origen wrote, hen you devote yourself to the divine reading, seek the meaning of divine words which is hidden from most people. Origen believed that The Word was incarnate in Scripture and could touch and teach readers and hearers. Origen taught that the reading of Scripture could help move beyond elementary thoughts, in Origens approach the major interpretive element of Scripture is Christ. In his view all Scriptural texts are secondary to Christ and are only revelations in as much as they refer to Christ as The Word of God, in this view, using Christ as the interpretive key unlocks the message in Scriptural texts. The primordial role of Origen in interpreting Scripture was acknowledged by Pope Benedict XVI, in the 4th century, as the Desert Fathers began to seek God in the deserts of Palestine and Egypt, they produced early models of Christian monastic life that persisted in the Eastern Church. These early communities gave rise to the tradition of a Christian life of constant prayer in a monastic setting. After Origen, Church Fathers such as St. Ambrose, St. Augustine, according to Jean Leclercq, OSB, the founders of the medieval tradition of Lectio Divina were Saint Benedict and Pope Gregory I.
Saint Bonaventure, born Giovanni di Fidanza, was an Italian medieval Franciscan, scholastic theologian and philosopher. The seventh Minister General of the Order of Friars Minor, he was Cardinal Bishop of Albano and he was canonised on 14 April 1482 by Pope Sixtus IV and declared a Doctor of the Church in the year 1588 by Pope Sixtus V. He is known as the Seraphic Doctor, many writings believed in the Middle Ages to be his are now collected under the name Pseudo-Bonaventure. He was born at Bagnorea in Umbria, not far from Viterbo, almost nothing is known of his childhood, other than the names of his parents, Giovanni di Fidanza and Maria Ritella. He entered the Franciscan Order in 1243 and studied at the University of Paris, possibly under Alexander of Hales, in 1253 he held the Franciscan chair at Paris. A dispute between seculars and mendicants delayed his reception as Master until 1257, where his degree was taken in company with Thomas Aquinas, after having successfully defended his order against the reproaches of the anti-mendicant party, he was elected Minister General of the Franciscan Order. On 24 November 1265, he was selected for the post of Archbishop of York, during his tenure, the General Chapter of Narbonne, held in 1260, promulgated a decree prohibiting the publication of any work out of the order without permission from the higher superiors. This prohibition has induced modern writers to pass judgment upon Roger Bacons superiors being envious of Bacons abilities. However, the prohibition enjoined on Bacon was a general one and its promulgation was not directed against him, but rather against Gerard of Borgo San Donnino. 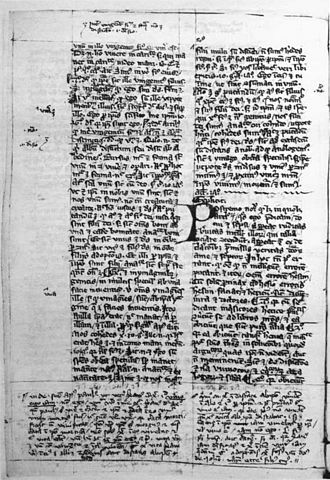 Gerard had published in 1254 without permission a heretical work, Introductorius in Evangelium æternum, thereupon the General Chapter of Narbonne promulgated the above-mentioned decree, identical with the constitutio gravis in contrarium Bacon speaks of. The above-mentioned prohibition was rescinded in Rogers favour unexpectedly in 1266, after his significant contributions led to a union of the Greek and Latin churches, Bonaventure died suddenly and in suspicious circumstances. The 1913 edition of the Catholic Encyclopedia has citations that suggest he was poisoned, but no mention is made of this in the 2003 second edition of the New Catholic Encyclopedia. The only extant relic of the saint is the arm and hand with which he wrote his Commentary on the Sentences and he steered the Franciscans on a moderate and intellectual course that made them the most prominent order in the Catholic Church until the coming of the Jesuits. His theology was marked by an attempt completely to integrate faith and he thought of Christ as the one true master who offers humans knowledge that begins in faith, is developed through rational understanding, and is perfected by mystical union with God. Bonaventures feast day was included in the General Roman Calendar immediately upon his canonisation in 1482. It was at first celebrated on the second Sunday in July, but was moved in 1568 to 14 July, since 15 July and it remained on that date, with the rank of double, until 1960, when it was reclassified as a feast of the third class. Gregory of Nyssa, known as Gregory Nyssen, was bishop of Nyssa from 372 to 376 and from 378 until his death. He is venerated as a saint in Roman Catholicism, Eastern Orthodoxy, Oriental Orthodoxy, Gregory, his elder brother Basil of Caesarea, and their friend Gregory of Nazianzus are collectively known as the Cappadocian Fathers. Gregorys philosophical writings were influenced by Origen, the book of Acts depicts that on the Day of Pentecost there were visiting Jews who were residents of. Cappadocia in attendance. In the First Epistle of Peter, written after AD65, there is no further reference to Cappadocia in the rest of the New Testament. Christianity arose in Cappadocia relatively late with no evidence of a Christian community before the second century AD. Alexander of Jerusalem was the first bishop of the province in the early to mid third century, the community remained very small throughout the third century, when Gregory Thaumaturgus acceded to the bishopric in c. 250, according to his namesake, the Nyssen, there were seventeen members of the Church in Caesarea. Cappadocian bishops were among those at the Council of Nicaea, because of the broad distribution of the population, rural bishops were appointed to support the Bishop of Caesarea. During the late fourth century there were around fifty of them, there were some adherents of heretical branches of Christianity, most notably Arians and Messalians. Gregory was born around 335, probably in or near the city of Neocaesarea, among his eight siblings were St. Macrina the Younger, St. Naucratius, St. Peter of Sebaste and St. Basil of Caesarea. It has been established that this occurred due to the death of one son in infancy. Gregorys parents had suffered persecution for their faith, he writes that they had their goods confiscated for confessing Christ, between the 320s to the early 340s the family rebuilt its fortunes, with Gregorys father working in the city of Neocaeaseria as an advocate and rhetorician. Gregorys temperament is said to be quiet and meek, in contrast to his brother Basil who was known to be more outspoken. 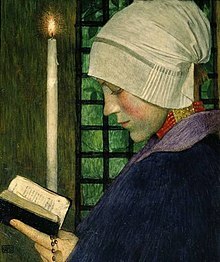 Marianne Stokes, born Marianne Preindlsberger, was an Austrian painter. She settled in England after her marriage to Adrian Scott Stokes, the landscape painter, Stokes was considered one of the leading artists in Victorian England. Preindlsberger was born in Graz and she painted in the countryside and Paris, and, as with many other young painters, fell under the spell of the rustic naturalist Jules Bastien-Lepage. Her style continued to show his influence even when her subject matter changed from rustic to medieval romantic, while in France she met the Finnish painter Helene Schjerfbeck, in whose company she visited Pont-Aven in 1883. Her first salon painting, which had painted in Brittany, was exhibited in 1885 at the Royal Academy. Her work was shown at the Grosvenor Gallery, New Gallery, and the Society of British Artists and in 1885. Together with her husband, she spent the summers of 1885 and 1886 at Skagen in the far north of Denmark where there was a colony which became known as the Skagen Painters. Hildegard of Bingen, O. S. B. known as Saint Hildegard and Sibyl of the Rhine, was a German Benedictine abbess, composer, Christian mystic and polymath. She is considered to be the founder of scientific history in Germany. Hildegard was elected magistra by her fellow nuns in 1136, she founded the monasteries of Rupertsberg in 1150, One of her works as a composer, the Ordo Virtutum, is an early example of liturgical drama and arguably the oldest surviving morality play. She is noted for the invention of a language known as Lingua Ignota. Although the history of her formal consideration is complicated, she has recognized as a saint by branches of the Roman Catholic Church for centuries. On 7 October 2012, Pope Benedict XVI named her a Doctor of the Church, Hildegard was born around the year 1098, although the exact date is uncertain. Her parents were Mechtild of Merxheim-Nahet and Hildebert of Bermersheim, a family of the lower nobility in the service of the Count Meginhard of Sponheim. Sickly from birth, Hildegard is traditionally considered their youngest and tenth child, in her Vita, Hildegard states that from a very young age she had experienced visions. 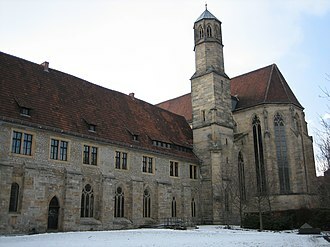 The date of Hildegards enclosure at the monastery is the subject of debate and her Vita says she was professed with an older woman, the daughter of Count Stephan II of Sponheim, at the age of eight. However, Juttas date of enclosure is known to have been in 1112 and their vows were received by Bishop Otto Bamberg on All Saints Day,1112. 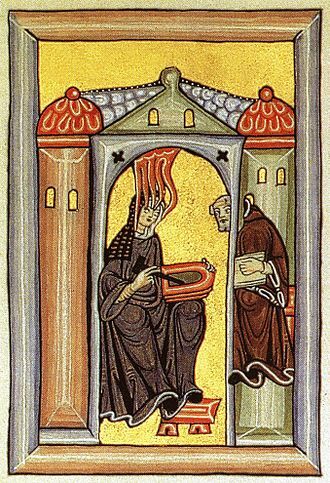 Some scholars speculate that Hildegard was placed in the care of Jutta at the age of eight, in any case and Jutta were enclosed together at the Disibodenberg, and formed the core of a growing community of women attached to the male monastery. Jutta was a visionary and thus attracted many followers who came to visit her at the cloister, Hildegard tells us that Jutta taught her to read and write, but that she was unlearned and therefore incapable of teaching Hildegard sound biblical interpretation. The written record of the Life of Jutta indicates that Hildegard probably assisted her in reciting the psalms, working in the garden and other handiwork and this might have been a time when Hildegard learned how to play the ten-stringed psaltery. The Blessed John van Ruysbroeck was one of the Flemish mystics. Some of his letters survive, as well as several short sayings. John had a mother, who brought him up in the Catholic faith. 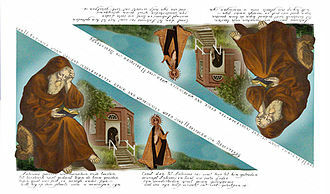 Johns surname, Van Ruusbroec, is not a surname in the modern sense but a toponym that refers to his native hamlet, modern-day Ruisbroek near Brussels. At the age of eleven he left his mother, departing without leave or warning, to himself under the guidance and tuition of his uncle, Jan Hinckaert. Hinckaert was living according to his Apostolic views with a fellow-canon and this uncle provided for Ruysbroecks education with a view to the priesthood. In due course, John was presented with a prebend in St. Gudules church and his mother had followed him to Brussels, entered a Béguinage there, and died shortly before his ordination. From 1318 until 1343 Ruysbroeck served as a parish priest at St Gudula and he continued to lead, together with his uncle Hinckaert and Van Coudenberg, a life of extreme austerity and retirement. Ruysbroeck responded with pamphlets written in the native tongue, the ruins of the monastery are still present in the forest of Soignes. But here so many disciples joined the company that it was found expedient to organize into a duly-authorized religious body. The hermitage was erected into a community of canons regular on 13 March 1349, and eventually it became the motherhouse of a congregation, Francis van Coudenberg was appointed first provost, and Blessed John Ruysbroeck prior. This period, from his religious profession to his death, was the most active and fruitful of Ruysbroecks career. During this time, his fame as a man of God, as a contemplative and a skilled director of souls, spread beyond the bounds of Flanders and Brabant to Holland, Germany. He had relations with the nearby Carthusian house at Herne, and we know that he had connections with the Friends of God in Strasbourg, and that in about 1378 he was visited by Geert Groote, the founder of the devotio moderna. It is possible, though disputed, that John Tauler came to see him, John died at Groenendaal, aged 82, on 2 December 1381. Fra Jacopone da Todi, O. F. M. was an Italian Franciscan friar from Umbria in the 13th century. He wrote several laudi in Italian and he was an early pioneer in Italian theatre, being one of the earliest scholars who dramatised Gospel subjects. Born Jacopo dei Benedetti, he was a member of a noble family and he studied law in Bologna and became a successful lawyer. At some point in his late 20s, he married a noblewoman, named Vanna according to some accounts. Due to his reputation as a worldly and greedy man, she took it herself to mortify her flesh in atonement for his behavior. Not long after their wedding, Benedetti urged his wife to attend a public tournament, in the course of the spectacle, she was killed when part of the stand in which she was sitting gave way. Rushing to her side, he discovered that she had been wearing a hairshirt, shocked, he realized that she had performed this penance for his sake. Benedetti gave up his practice, gave away all his possessions and from about 1268 lived as a wandering ascetic. During this period, he gained a reputation as a madman, due to his behavior, acting out his spiritual vision. Examples of this behavior included appearing in the square of Todi, wearing a saddle. On another occasion, he appeared at a wedding in his brothers house, after about ten years of this life, Benedetti sought admission to the Friars Minor, but they were reluctant to accept him due to his reputation. He soon composed a poem on the vanities of the world. He chose to live as a lay brother, by this time, two broad factions had arisen in the Franciscan Order, one with a more lenient, less mystical attitude and one being more severe, preaching absolute poverty and penitence. But Celestine resigned the papacy before action was taken and was succeeded by Pope Boniface VIII, during the struggle that followed, Jacopone publicized the Spirituals cause by writing verses highly critical of their opponents, the Pope included. A battle between the two rival parties ensued, ending with the siege of Palestrina and the imprisonment and excommunication of Jacopone in 1298 and he was freed in 1303 upon the death of Boniface, having been specifically excluded from the Jubilee Year of 1300 by papal bull. Christian mysticism refers to the development of mystical practices and theory within Christianity. It has often connected to mystical theology, especially in the Roman Catholic. The attributes and means by which Christian mysticism is studied and practiced are varied and they range from ecstatic visions of the souls mystical union with God to simple prayerful contemplation of Holy Scripture. Mysticism is derived from the Greek μυω, meaning to conceal, in the Hellenistic world, a mystikos was an initiate of a mystery religion. Mystical referred to religious rituals and use of the word lacked any direct references to the transcendental. In early Christianity the term referred to three dimensions, which soon became intertwined, namely the biblical, the liturgical and the spiritual or contemplative. The biblical dimension refers to hidden or allegorical interpretations of Scriptures, the liturgical dimension refers to the liturgical mystery of the Eucharist, the presence of Christ at the Eucharist. The third dimension is the contemplative or experiential knowledge of God, William James popularized the use of the term religious experience in his 1902 book The Varieties of Religious Experience. It has influenced the understanding of mysticism as an experience which supplies knowledge. Wayne Proudfoot traces the roots of the notion of religious experience further back to the German theologian Friedrich Schleiermacher, the notion of religious experience was used by Schleiermacher to defend religion against the growing scientific and secular critique. It was adopted by scholars of religion, of which William James was the most influential. Other critics point out that the stress on experience is accompanied by favoring the atomic individual, transformation has particular importance in the theology of Origen. Mystical experience is not simply a matter between the mystic and God, but is shaped by cultural issues. Thus, the nature of experience could be tailored to the particular cultural and theological issues of the time. Asceticism is a lifestyle characterized by abstinence from worldly pleasures, often for the purpose of pursuing spiritual goals. Asceticism is classified into two types, Asceticism has been historically observed in many religious traditions, including Buddhism, Hinduism and Judaism. Mainstream Islam has lacked asceticism, except for its minority Sufi sect whose long tradition has included strict asceticism, the practitioners of these religions eschewed worldly pleasures and led an abstinent lifestyle, in the pursuit of redemption, salvation or spirituality. Asceticism is seen in the ancient theologies as a journey towards spiritual transformation, where the simple is sufficient, the bliss is within, the adjective ascetic derives from the ancient Greek term askēsis, which means training or exercise. The original usage did not refer to self-denial, but to the training required for athletic events. Its usage extended to rigorous practices that are used in all religious traditions, in varying degrees to attain redemption. Asceticism has been classified into natural and unnatural forms of asceticism, natural asceticism is defined as a lifestyle where material aspects of life are reduced to utmost simplicity and minimum. This may include minimal, simple clothing, sleeping on floor or caves, natural asceticism, state Wimbush and Valantasis, does not include maiming the body or harsher austerities that make the body suffer. Self-discipline and abstinence in some form and degree are parts of religious practice within many religious, ascetic lifestyle is associated particularly with monks, fakirs in Abrahamic religions, and bhikkhus, sannyasis, yogis in Indian religions. Christian authors of antiquity such as Origen, St. Jerome, St. Ignatius, John Chrysostom. Scriptural examples of asceticism could be found in the lives of John the Baptist, the twelve apostles, the Dead Sea Scrolls revealed ascetic practices of the ancient Jewish sect of Essenes who took vows of abstinence to prepare for a holy war. An emphasis on a religious life was evident in both early Christian writings and practices. 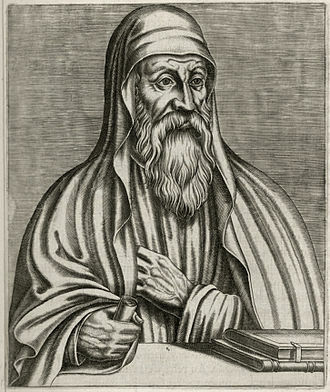 Other Christian practitioners of asceticism include individuals such as Simeon Stylites, Saint David of Wales, according to Richard Finn, much of early Christian asceticism has been traced to Judaism, but not to traditions within Greek asceticism. 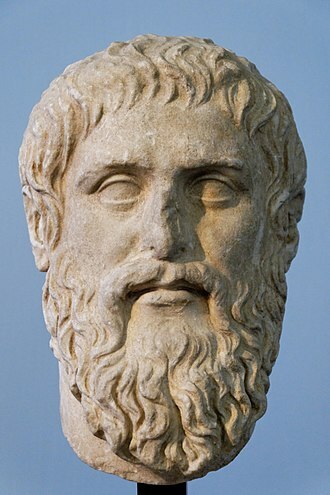 Some of the thoughts in Christianity nevertheless, Finn states, have roots in Greek moral thought. Virtuous living is not possible when an individual is craving bodily pleasures with desire, the deserts of the Middle East were at one time inhabited by thousands of Christian hermits including St. Anthony the Great, St. Mary of Egypt, and St. Simeon Stylites. In 963 CE, an association of monasteries called Lavra was formed on Mount Athos and this became the most important center of orthodox Christian ascetic groups in the centuries that followed. In the modern era, Mount Athos and Meteora have remained a significant center, sexual abstinence such as those of the Encratites sect of Christians was only one aspect of ascetic renunciation, and both natural and unnatural asceticism have been part of Christian asceticism. Although the experience is usually brief in time, there are records of such experiences lasting several days or even more, and of recurring experiences of ecstasy during ones lifetime. A persons sense of time and space disappear during a religious ecstasy forsaking any senses or physical cognizance in its duration. Among venerated Catholic saints who dabble in Christian mysticism, a physical stature, human sensory, or perception is completely detached to time. In Sufism, the term is referred to as wajd and the experience is referred to as either jazbah or majzoobiyat, the adjective religious means that the experience occurs in connection with religious activities or is interpreted in context of a religion. Thus we find experiences given such names as nature, aesthetic, neo-platonic, ecstasies enjoyed by accepted religious mystics are usually called religious experiences no matter what the nature of the ecstasy or the trigger inducing it. Religious people may hold the view that true religious ecstasy occurs only in their religious context, an ecstatic experience may take place in occasion of contact with something or somebody perceived as extremely beautiful or holy. It may happen without any known reason, the particular technique that an individual uses to induce ecstasy is usually one that is associated with that individuals particular religious and cultural traditions. As a result, an experience is usually interpreted within the particular individual religious context. Athletes may follow rituals in preparing for contests, which are dismissed as superstition, Yoga provides techniques to attain an ecstasy state called samādhi. According to practitioners, there are stages of ecstasy, the highest being Nirvikalpa Samadhi. Bhakti Yoga especially, places emphasis on ecstasy as being one of the fruits of its practice, in Buddhism, especially in the Pali Canon, there are eight states of trance called absorption. The first four states are Rupa or, materially-oriented, the next four are Arupa or non-material. These eight states are preliminary trances which lead up to final saturation, in Visuddhimagga, great effort and years of sustained meditation are practiced to reach the first absorption, and that not all individuals are able to accomplish it at all. It is possible to experience the absorptions in a less intense state with much less practice, in the Dionysian Mysteries, initiates used intoxicants and other trance-inducing techniques to remove inhibitions and social constraints, liberating the individual to return to a natural state. In the monotheistic tradition, ecstasy is usually associated with communion, such experiences can be personal mystical experiences with no significance to anyone but the person experiencing them. Some charismatic Christians practice ecstatic states and interpret these as given by the Holy Spirit, the firewalkers of Greece dance themselves into a state of ecstasy at the annual Anastenaria, when they believe themselves under the influence of Saint Constantine. In modern Pentecostal and spirit-filled Christianity, numerous examples of religious ecstasy have transpired and these occurrences however, have changed significantly since the time of the Toronto Blessing phenomena and several other North American so-called revivals and outpourings from the mid 1990s. Angela of Foligno, T. O. S. F. was an Italian Franciscan tertiary who became known as a mystic from her extensive writings about her mystical revelations. Due to the respect they engendered in the Catholic Church, she is known as Mistress of Theologians, the Catholic Church declared Angela to be a saint in 2013. Angelas birth date, which is not known with certainty, is listed as 1248. She was born into a family at Foligno, in Umbria. Married, perhaps at an age, she had several children. Angela reports that she loved the world and its pleasures, around the age of 40, she reportedly had a vision of St. Francis and recognized the emptiness of her life. From that time, she began to lead a life devoted to higher perfection, three years later, Angelas mother died, followed, a few months later, by her husband and children. With one serving woman, Masazuola, as her companion, she began to divest herself of her possessions, Angela joined the Third Order of St. Francis, probably in 1291. She placed herself under the direction of a Franciscan friar named Arnoldo, considered a great medieval mystic, Angela is said to have received mystical revelations, which she dictated to a scribe in the late 13th century. These accounts are contained in a compilation of two works, usually published under the title Il Libro della Beata Angela da Foligno, Angela recorded the history of her conversion in her Book of Visions and Instructions. She dictated, in her Umbrian dialect, an account of her progress, known as the Memoriale. This work was begun in 1292. The Memorial is the first part of two sections of Angela of Folignos Liber, the second text is known as Instructions and is composed of thirty-six instructional texts, a note about her death, and an epilogue. These texts appear in different orders in different manuscripts, and there is not known to be one correct order, the text was finished by 1298, and submitted to Cardinal James of Colonna and eight Friars Minor, who gave it their approval. It seems that Brother A. revised it shortly after, in 1299-1300, the final version of the Book appends a series of 36 Instructions to the Memorial. These reflect Angela’s teaching during this period and these teachings are rather more conventional in tone and have differences in vocabulary and emphasis from the Memorial – which may reflect redaction by several hands. Saint Francis of Assisi, born Giovanni di Pietro di Bernardone, informally named as Francesco, was an Italian Roman Catholic friar and preacher. He founded the mens Order of Friars Minor, the women’s Order of Saint Clare, the Third Order of Saint Francis, Francis is one of the most venerated religious figures in history. Pope Gregory IX canonized Francis on 16 July 1228, along with Saint Catherine of Siena, he was designated Patron saint of Italy. In 1219, he went to Egypt in an attempt to convert the Sultan to put an end to the conflict of the Crusades, by this point, the Franciscan Order had grown to such an extent that its primitive organizational structure was no longer sufficient. He returned to Italy to organize the Order, once his community was authorized by the Pope, he withdrew increasingly from external affairs. Francis is known for his love of the Eucharist, in 1223, Francis arranged for the first Christmas live nativity scene. He died during the hours of 3 October 1226, while listening to a reading he had requested of Psalm 142. Pietro was in France on business when Francis was born in Assisi, upon his return to Assisi, Pietro took to calling his son Francesco, possibly in honor of his commercial success and enthusiasm for all things French. Since the child was renamed in infancy, the change can hardly have had anything to do with his aptitude for learning French, as some have thought. While going off to war in 1202, Francis had a vision that directed him back to Assisi, in 1205, Francis left for Apulia to enlist in the army of Walter III, Count of Brienne. Francis lived the high-spirited life typical of a young man. In 1201, he joined an expedition against Perugia and was taken as a prisoner at Collestrada. It is possible that his conversion was a gradual process rooted in this experience. Upon his return to Assisi in 1203, Francis returned to his carefree life, in 1204, a serious illness led him to a spiritual crisis. A strange vision made him return to Assisi, deepening his ecclesiastical awakening, on a pilgrimage to Rome, he joined the poor in begging at St.
Nun profession ceremony.The profession ceremony for a new nun, admitted to the cloister (behind the half door). A Sufi Muslim ascetic (fakir) in Bengal in the 1860s. Chassidei Ashkenaz were a Jewish mystical and ascetic movement in medieval Germany. The Buddha as an ascetic. Gandhara, 2-3rd century CE. British Museum. A female ascetic of the Vaishnavism tradition, 19th-century India. 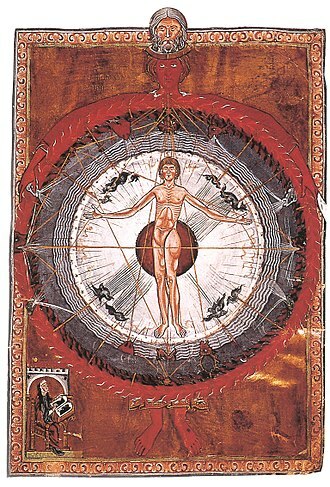 "Universal Man" illumination from Hildegard's Liber Divinorum Operum, I.2. Lucca, MS 1942, early 13th-century copy. St. Anthony's birthplace at the crypt of the church dedicated to him in Lisbon. Saint Anthony of Padua Holding Baby Jesus by Strozzi, c. 1625; the white lily represents purity. Julian of Norwich's statue on the West Front of Norwich Cathedral. The statue was made by the sculptor David Holgate in 2014. Jan Ruysbroeck Weg sign on walls of his old monastery at Groenendaal. Byzantine miniature depicting the Monastery of Stoudios. Remaining walls of Monastery of Stoudios in modern-day Istanbul. The First Council of Constantinople, as depicted in a fresco in the Stavropoleos Monastery, Bucharest, Romania. "As we celebrate with our festive gatherings the birthday of this great man, the Lord’s forerunner, the blessed John, let us ask for the help of his prayers. Because he is the friend of the bridegroom, you see, he can also obtain for us that we can belong to the bridegroom, that we may be thought worthy to obtain his grace." – St. Augustine. "Woman's Holy War. Grand Charge on the Enemy's Works". An allegorical 1874 political cartoon print, which somewhat unusually shows temperance campaigners (alcohol prohibition advocates) as virtuous armored women warriors (riding sidesaddle), wielding axes Carrie-Nation-style to destroy barrels of Beer, Whisky, Gin, Rum, Brandy, Wine and Liquors, under the banners of "In the name of God and humanity" and "Temperance League". The foremost woman bears the shield seen in the Seal of the United States (based on the U.S. flag), suggesting the patriotic motivations of temperance campaigners. The shoe and pants-leg of a fleeing male miscreant are seen at lower right. Santa Lutgarda by Goya, 1787. Monasterio de San Joaquín y Santa Ana, Valladolid.